Two teenage boys have been arrested after an 11-year-old was shot dead on his way home from playing football. The pair, aged 14 and 18, are being held over the murder of Rhys Jones who was shot by a youth on a BMX bicycle at a pub car park in Croxteth, Liverpool. A family friend said Rhys spent his last moments with his mother, who raced to the scene when told of the shooting. 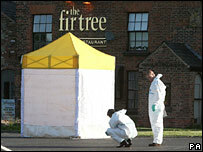 Prime Minister Gordon Brown said it was a "heinous crime that shocked the whole of the country". The BBC's Nick Ravenscroft said police were expecting to make more arrests, either later in the day or during the week. Merseyside Chief Constable Bernard Hogan-Howe said: "There have been two arrests in this case, but that doesn't prove anything. "The principal thing I need to get over to the public is we need your help, and we are not yet at all certain as to who committed this crime." Tony Edge, 40, described how he broke the news to Rhys's mother, Melanie, before driving her to the scene at the Fir Tree public house. "She went to him, knelt down, held him and spoke to him," said Mr Edge, a children's football coach. "I don't know what she was saying to him because I walked away from it." Rhys, who lived a few streets away with his mother, father and 17-year-old brother, was on his way home from football training with two friends, still wearing his kit, when he was shot at about 1930 BST. Mr Hogan-Howe said his reaction to the murder was one of "absolute shock and horror". "Somebody out there will know who did this. They will know who committed the crime and who provided the weapon - and we want them both," he said. 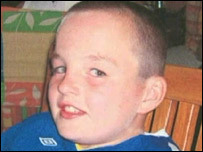 Asked what the Government is doing about levels of gun crime in the wake of Rhys Jones' death, Children and Youth Justice Minister Beverley Hughes said: "This is an issue for the police, local authorities, and the Government. "It is also an issue for communities and parents." Her comments come as the leader of Liverpool City Council, Warren Bradley, called for a "summit" of all major cities to be held with the home secretary to discuss ways of tackling gun crime following Rhys's killing. Mr Bradley said: "This is an issue that all major cities face. "I am requesting a summit consisting of community leaders, police, emergency services and reformed criminals of all major cities to be held with the home secretary to find solutions to the issues we all face." Rhys was due to start secondary education in September having finished attending the local Broad Square Primary School in July. In a statement, headteacher Elaine Spencer said the whole school was in a state of shock and offered her sympathies to the family. "Rhys was a really lovely boy who was extremely popular with everyone who knew him. He was friendly, outgoing and mad about football. "He had a wonderful future ahead of him and it is absolutely terrible that it seems his life has been cut short because he was in the wrong place at the wrong time," she said. Neighbour Tony Ainscough, 31, whose nine-year-old son was a friend of Rhys, added: "He was an absolutely brilliant little lad, an innocent little kid. "He and my son would play computer games together, there's no way he had anything to do with gangs and people need to know that." About 100 officers have been assigned to the investigation and police are still examining the scene on Fir Tree Drive. In the last year there has been an overall reduction in the amount of gun crime in the Liverpool, Mr Hogan-Howe said. Merseyside Police's Matrix team, which has about 200 officers, executes an average of three warrants a week and has seized about 50 weapons in the past year. Langley Close, the area around the pub, was made a "designated area" by Merseyside Police last year, meaning officers could disperse groups and move people away from the area. The decision was made in response to concerns raised by local residents about youths gathering outside the pub and local shops. The Fir Tree pub where Rhys was gunned down stands next to a collection of shops and a car park that is notorious for attracting gangs of youths, say local residents. "There is a real problem with anti-social behaviour," said a local woman who did not want to be identified. "Close to where Rhys was killed, near the shops, they sell drugs and have guns. "There aren't enough police on the streets. You never see them round here until something bad happens and by then it's too late." The landlord of the Fir Tree pub, who did not want to be named, said that parishioners from St Cuthbert's Church and local residents had asked the council and police to help install CCTV in the area but had been turned down on grounds of costs. He added: "It's taken this now for people to say, 'let's come together to work it out'."